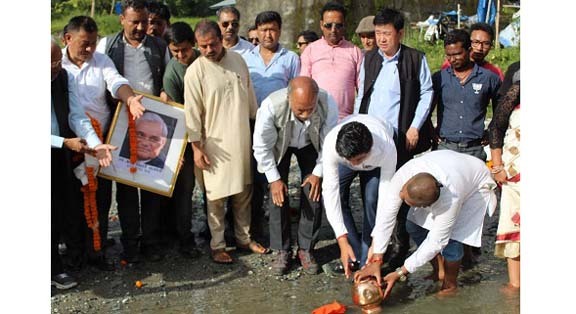 The Bharatiya Janata Party (BJP) took out ‘Asthi Kalash Yatra’ to immerse the ashes of its founding president and late Prime Minister Atal Bihari Vajpayee across the country on Thursday. On the occasion, Bharatiya Janta Party’s Sikkim Pradesh also took out ‘Asthi Kalash Yatra’ from its party office at Golitar in Singtam under East Sikkim and covered the route of Singtam, 32 No, Ranipool, Gangtok and returned back to Rangpo and immersed the ashes of the former PM by following Hindu rituals at the meeting point of Rangpo River and Teesta River at Rangpo in East Sikkim. It may be mentioned that BJP State president DB Chauhan and treasurer GD Agarwal from Sikkim participated in the funeral of late Vajpayee on August 17 . Chauhan received the urn carrying the ashes of late Prime Minister Atal Bihari Vajpayee at the BJP head office on August 22 and returned back to Sikkim on the same day. The State BJP president mentioned about various opportunities received by Sikkim during the tenure of Vajpayee as the Prime Minister. He also spoke about the significant initiatives and works in various areas by the former PM. On the occasion, leaders, youths and members of BJP State unit and BJP members from Kalimpong district were also present during the immersion of ashes of the former PM.